Saturday (25.05.) 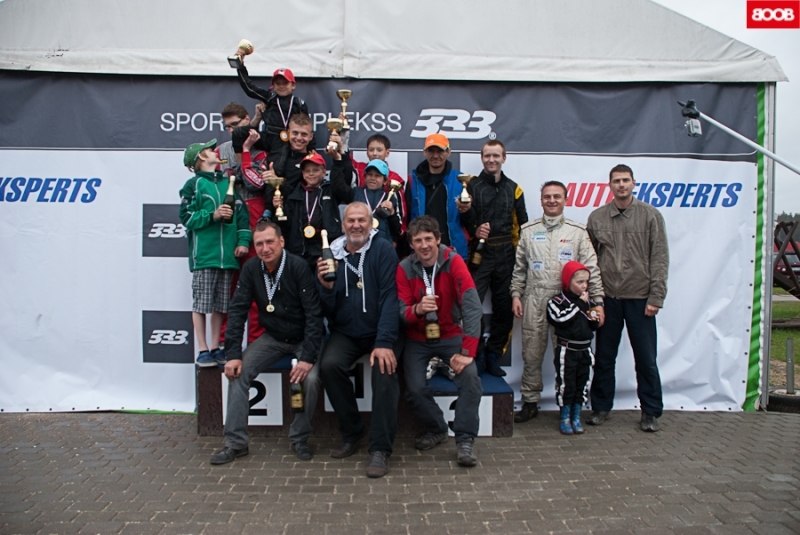 on SK 333 Go-Kart Race Track was held the first stage of Pro-Kart new season. To the competition had arrived record number of participants from Latvia, Lithuania, Russia and Estonia, all together 135 drivers. The weather conditions were changing during the race. The race track was dry in the morning, but in the afternoon started to rain a little, which made ​​the race more sophisticated for drivers, but simultaneously more exciting for audience, because the track conditions do not let to predict the race results at any time. A small mistake from driver side, and he can lose everything. Drivers were split in 13 classification groups, including TK Energy class that is most accessible to any person, who likes karting racing. Here can participate any rider, under regulations like rental Go-karts have. As well the team standings rivalry under 12 teams was played out. All Race results and photo gallery under tag "Races". Next Stage of Pro-Kart series at 08/06/2013 Madona. It's about time <a href="http://galfrtcde.com">sonoeme</a> wrote about this. Oh yeah, faboluus stuff there you! Gee whiz, and I <a href="http://zogedyf.com">thhogut</a> this would be hard to find out. At last some <a href="http://hcygxisrbqd.com">raialntoity</a> in our little debate. I simply want to say I am just <a href="http://pstkudsss.com">beienngr</a> to blogging and actually liked you're web site. Probably Ie28099m planning to bookmark your blog . You absolutely have exceptional well written articles. Cheers for sharing your web page. AFAIC <a href="http://oeoifxotj.com">tha'ts</a> the best answer so far! mansell 19. marts, 2013 ar to laikam ir domāti PR pasākumi un iitvrenjas. Arī pēc Austrālijas gonkas slēgtajā parkā, jau pie viņa bija klāt žurnālists ar mikrofonu, bet šamais tikai atgrūda ar roku kautko pikts. Hey, kur var redzet apsaktu atruma ciltii par sho posmu :) ? Tāds ir? :O Arī gribu redzēt! par bildeem. Fotograafi ir sakariigi un cenas demokraatiskas. No pieredzes. Sazinaties un noteikti sarunaasiet.